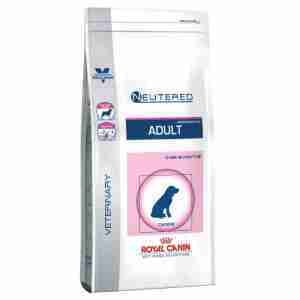 Royal Canin Vet Care Nutrition Neutered Adult Medium Dog has been designed to provide all the nutrition a neutered dog over 12 months old needs, while also helping to maintain a healthy weight. The food has a low calorie count, which keeps your dog’s weight down. This, combined with hydrolysed proteins, means that every meal is satisfying and healthy. Hydrolysed proteins are proteins that are already partially broken down into smaller components, meaning that they're easier for your dog to digest and absorb. The wide range of nutrients in the food also provides a number of benefits, helping your dog’s coat to stay healthy and shiny. These balanced nutrients also maintain your dog’s digestive system by promoting the development of good bacteria in the gut. A wide flavour profile makes extremely palatable, meaning it's easy to incorporate into your dog's feeding habits. Additional antioxidants are included in the mix too. This gives your dog excellent defence against free radical formation. Free radicals can eventually cause damage to your dog’s immune system, which can lead to further infections and diseases. antioxidants that combat free radical formation. There are many benefits to neutering your dog, including a greatly reduced risk of prostate disorder, less dominance and aggression and reduced sexual behaviour. There are also however, some side effects that can cause potential problems for your dog. Neutering alters the hormone flow and metabolism in your pet, which means that they don’t need the same amount of food as before the procedure. If you notice that your dog has started to gain weight after neutering, then changing diet can be an option. A specially formulated food such as Royal Canin Vet Care Nutrition Neutered Adult Medium Dog helps to satisfy your dog’s hunger, so they eat less. Combined with plenty of runs in the park or walks around the block, your dog will stay fit and healthy. Because veterinary diets are formulated for the nutritional support of pets with specific clinical conditions, we recommend that you only use them under professional advice. For more information on feeding Royal Canin Vet Care Nutrition Neutered Adult Medium Dog to your dog, please consult your veterinary surgeon. COMPOSITION:Maize, barley, dehydrated pork protein, dehydrated poultry protein, wheat flour, vegetable fibres, hydrolysed animal proteins, animal fats, beet pulp, wheat gluten*, minerals, soya oil, fish oil, fructo-oligo-saccharides, psyllium husks and seeds, borage oil, marigold extract (source of lutein). ADDITIVES (per kg): Nutritional additives: Vitamin A: 17500 IU, Vitamin D3: 1000 IU, E1 (Iron): 46 mg, E2 (Iodine): 3.6 mg, E4 (Copper): 8 mg, E5 (Manganese): 60 mg, E6 (Zinc): 198 mg, E8 (Selenium): 0.08 mg - Preservatives - Antioxidants. ANALYTICAL CONSTITUENTS: Protein: 28% - Fat content: 11% - Crude ash: 5.7% - Crude fibres: 7.3%. *L.I.P. : protein selected for its very high assimilation. My dog loves this particular food. made my order, competitive prices, free delivery, arrived quickly. What more can you ask for? My dog loves this food.